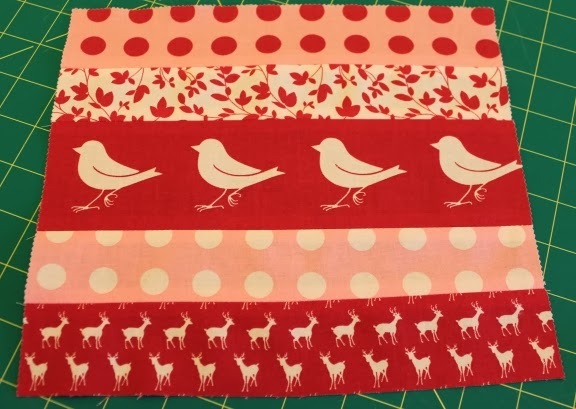 I am so excited to be a part of the Mystery Sew Red Sew-along that is being hosted by Jimmy Bean's! If you are not already participating in this project, you can click on the link above to get the scoop!! This is block #5 for the series. This block measures 10 1/2" square. 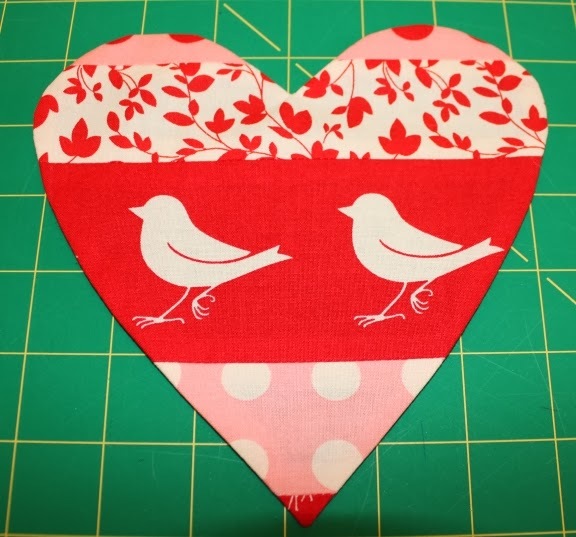 I used a square from a layer cake of precut fabrics for the background but any fabric you have lying around that meets the size requirement will work. 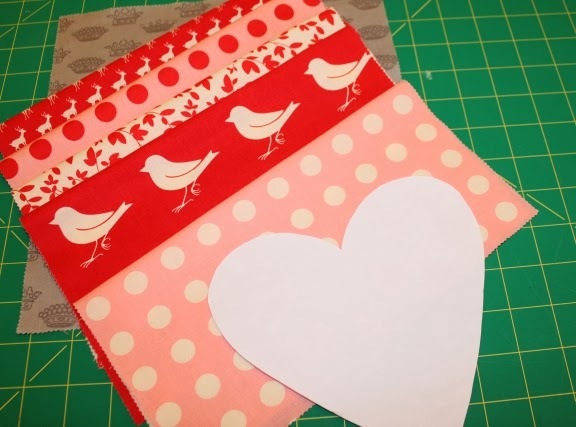 The best part about this block is that you can use up little scraps you may have left from another project! Start by folding the paper in half so that it measures 5.75 x 5.5. 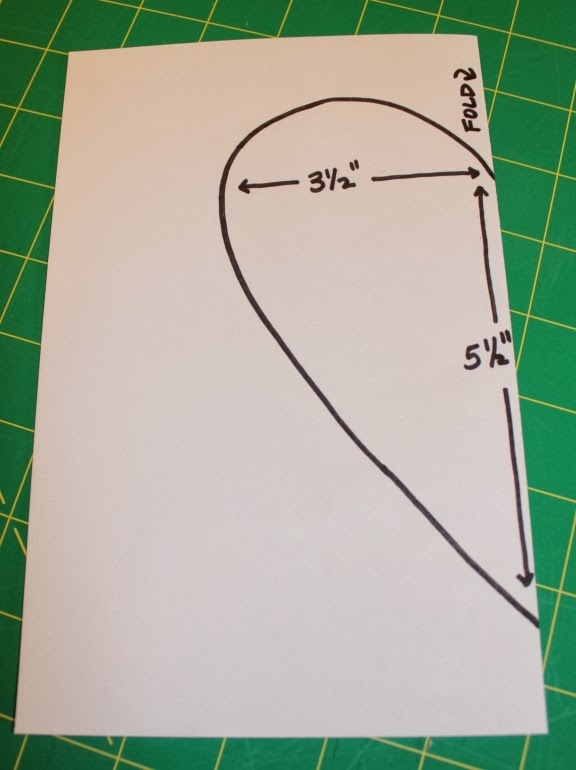 Now is the time to use your mad skills from when you were a kid cutting out paper hearts for Valentine's day....draw and cut out a heart approximately the size shown below. IMPORTANT!! Save the outer portion that you cut the heart from as you will use this in a later step. Lay out your fabrics in an order that is pleasing to you. 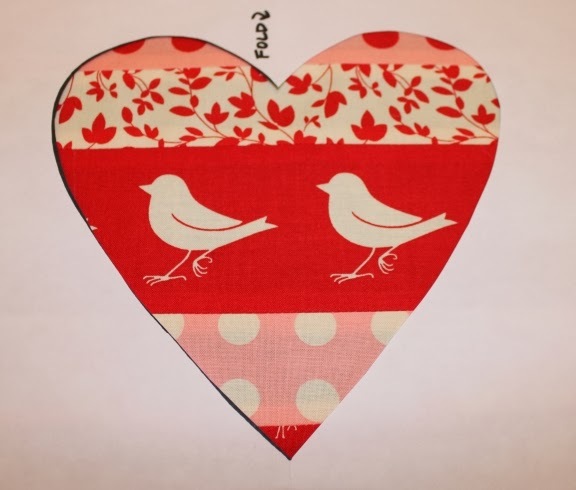 Notice how I cut out this line of birds to showcase it through the heart. 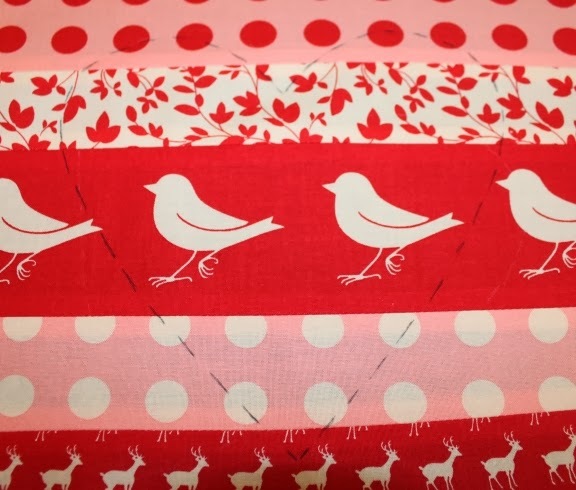 I made sure to allow my 1/4" seam allowance plus a little extra above and below the birds. 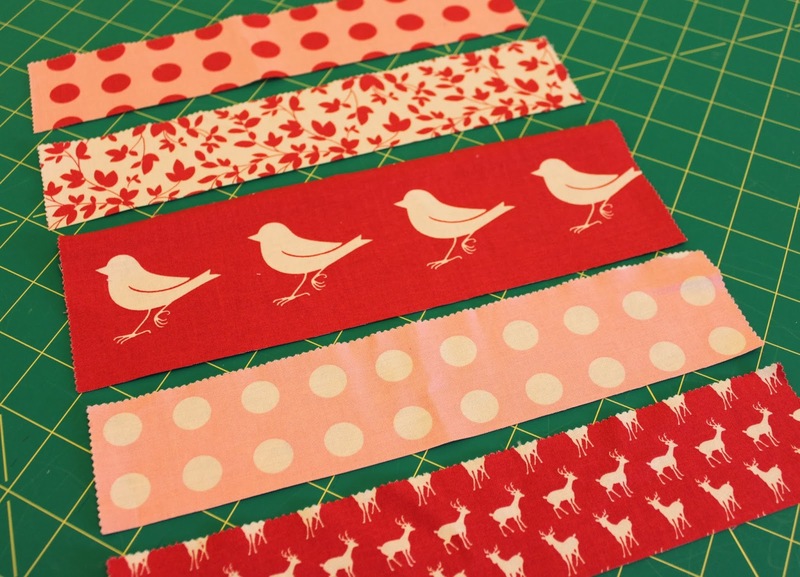 For the remaining 4 fabrics, I cut strips that were 2" wide. Since I was again working with leftover squares from a layer cake, these measure 10 1/2" wide, but you won't need more than about 8". 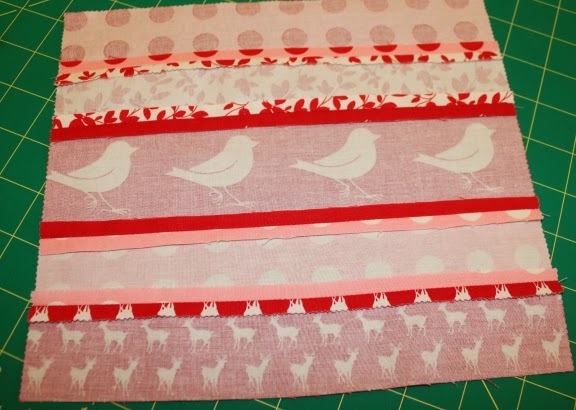 Stitch the strips right sides together with a 1/4" seam allowance. 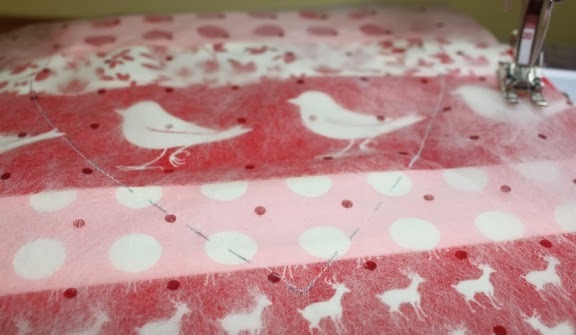 Using the outer portion of the paper from earlier, lay it over the fabric strip unit. Move it around until you are happy with the placement. 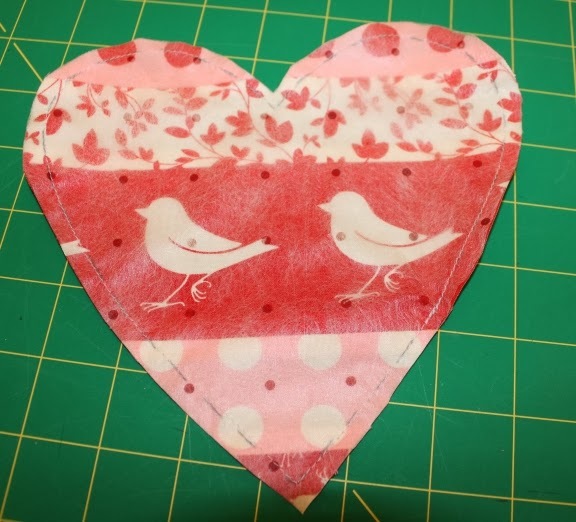 Keep in mind that the edge of the heart is the stitching line, so the seam allowances will be OUTSIDE of this area. I liked the strips going horizontally, but you could do a vertical or diagonal placement as well. 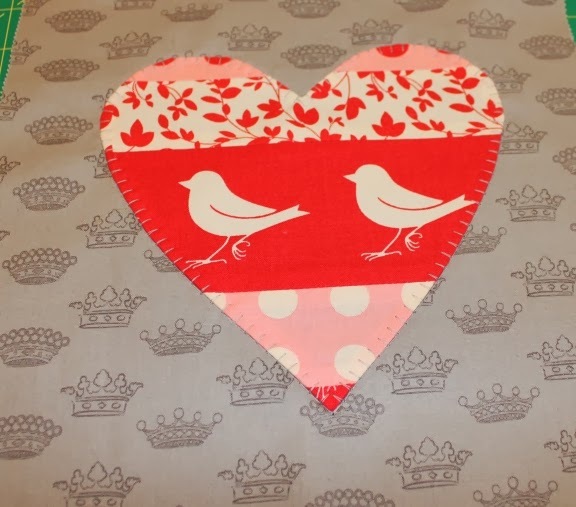 Once you have the heart shape placed where you like, use a fabric marking pen to mark the edge of the heart shape. 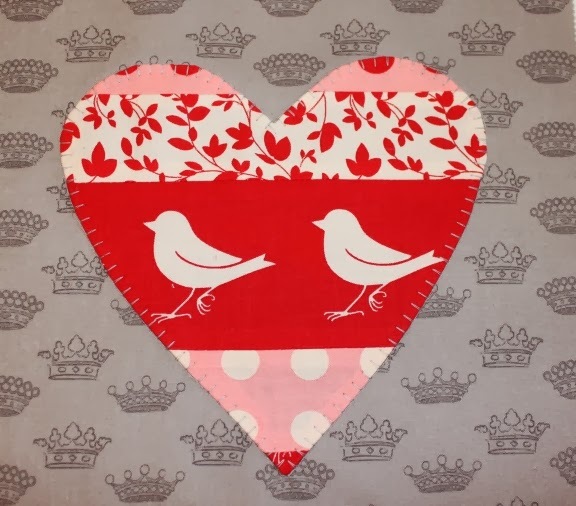 Here is the fabric unit with the heart shape. 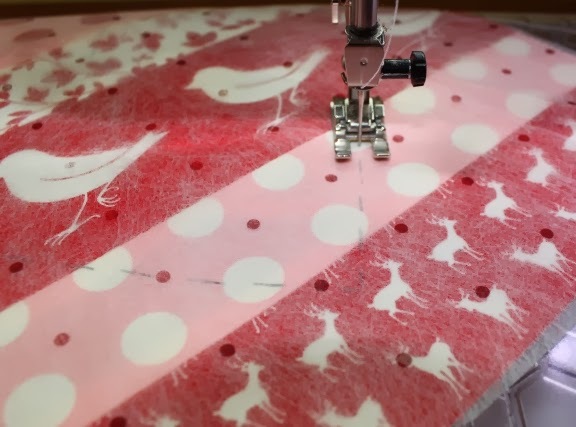 Next, place the non fusible interfacing on top of the RIGHT SIDE of the fabric unit. 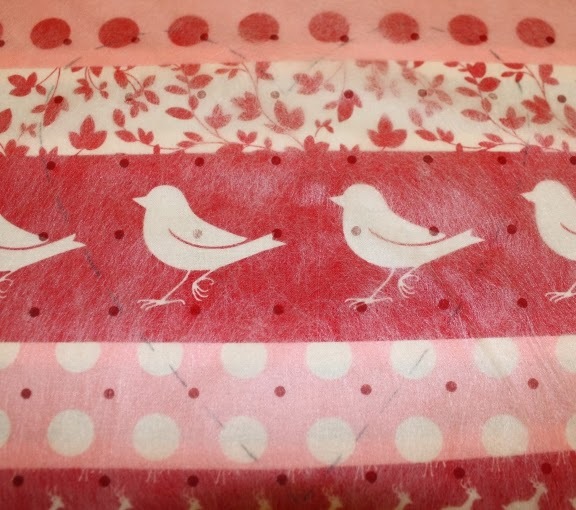 I didn't have any non fusible lying around, so I used some pattern tracing cloth. 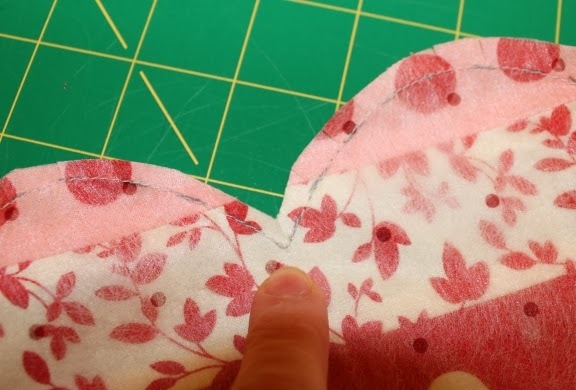 It is important to use something that is semi-transparent so that you can see the outline of the heart in order to stitch. Stitch on top of the marking all the way around, backstitching at the beginning and ending of stitching. Here is the stitching completed. 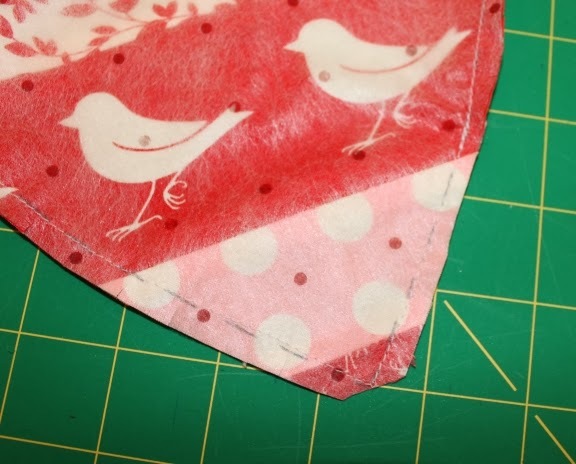 Cut away the excess fabric, 1/4" away from the stitching line. Trim off the fabric close to the point. Clip to the inner point of the heart. Be careful not to clip through your stitching. Clip the curves of the heart. 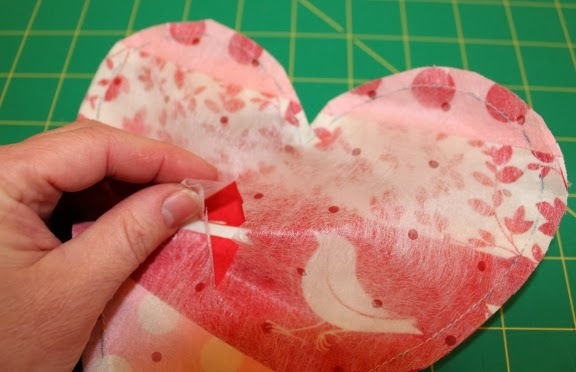 Pull the interfacing away from the heart and clip an opening. Turn the heart through the opening. This is what it will look like from the wrong side. Here is what it looks like before pressing. Be sure to fully turn out the curved sections as well as inner and outer points. Here is the heart after pressing. Center the heart on the background fabric. Mine measured approximately 1 3/4" from the side edges. 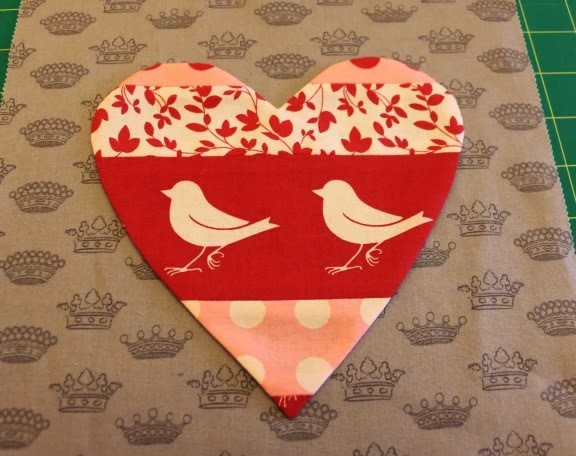 Use temporary adhesive spray or pins to secure the heart and prepare it for stitching. 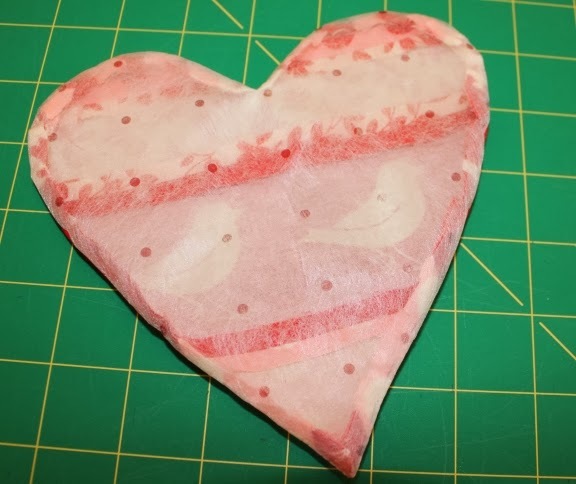 Complete the heart by stitching around the outside edge. 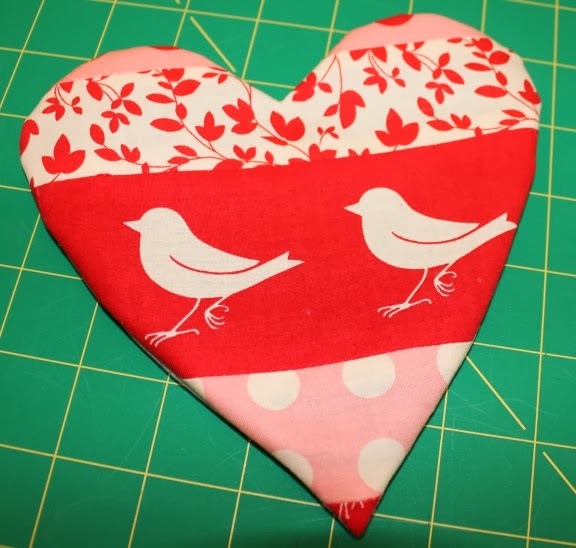 I used a wide blanket stitch on my machine.